Summer and fruit go hand in hand. 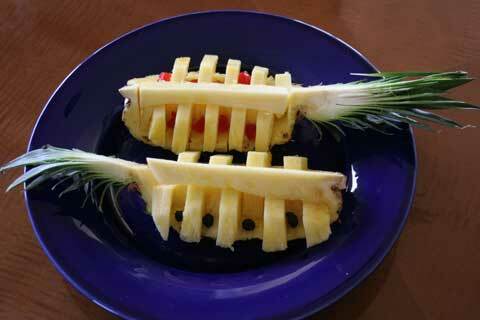 Here's a quick, attractive way to serve a pineapple. First...give your pineapple a good rinse and set out your cutting board. Remember that if you put a wet rag under the board it won't slip and move as you are cutting. The first cut is lengthwise down the middle and into the top leaves. That leaves you with two halves. You can save one half or use the whole fruit. Now cut the half into half again to get quarter sections, also cutting carefully into the top leaves, again. Take your paring knife and cut the fruit close to the skin, around the bottom, loosening the fruit from the skin. And then cut the triangular section off the top to remove the core. Cut thick slices all the way across the quarter section, And then push the slices alternately in and out so that they create the effect illustrated. Place a cherry or blueberry or piece of a strawberry in each of the open sections. Anything contrasting in color. Set them on a colorful platter and watch it disappear.